William John Melhuish was born in Yeovil on 28 October 1894, the illegitimate son of charwoman Sophia Rachael Titmus (1872-1925), originally from Hatfield. He was recorded variously as William Titmus, William Melhuish (presumably his father's surname) and William Melhuish-Titmus. Sadly nothing is known of his early life but he is listed in the 1911 census living with his mother and a lodger at York Place, Kingston. 15-year old William (recorded as Titmus) was working as an errand boy. During 1915 William enlisted (as Melhuish) and became a Private, Service No PO/16514, in the Royal Marine Light Infantry. After training he served on board HMS Hampshire. HMS Hampshire was one of six Devonshire-class armoured cruisers built for the Royal Navy in the first decade of the 20th century. She was assigned to the China Station in 1912 and remained there until the start of World War I in August 1914. The ship hunted for German commerce raiders until she was transferred to the Grand Fleet at the end of 1914. She was assigned to the 7th Cruiser Squadron upon her return home. She was transferred to the 2nd Cruiser Squadron in 1916 and was present at the Battle of Jutland. The Battle of Jutland was a naval battle fought by the Royal Navy's Grand Fleet against the Imperial German Navy's High Seas Fleet. The battle was fought on 31 May and 1 June 1916 in the North Sea near Jutland, Denmark. It was the largest naval battle and the only full-scale clash of battleships in the war. Fourteen British and eleven German ships were sunk with 6,094 killed and 674 wounded on the Allied side and 2,551 Germans killed and 507 wounded. After the battle Walter sent a postcard home to say that he had survived the battle. Several days later HMS Hampshire was sailing to Russia, carrying the Secretary of State for War, Field Marshal Lord Kitchener, when she is believed to have struck a mine laid by a German submarine. She sank with heavy loss of life, including William Melhuish, Lord Kitchener and his staff. Another Yeovil lad who went down with the Hampshire was 19-year old Harry Parsons. On 30 June 1916 the Western Gazette reported "Private WJ Melhuish-Titmus, whose parents live at York Place, Kingston, Yeovil, was one of the crew of HMS Hampshire recently lost at sea with Lord Kitchener on board. The young soldier was 20 years of age." William's body was not recovered for burial. 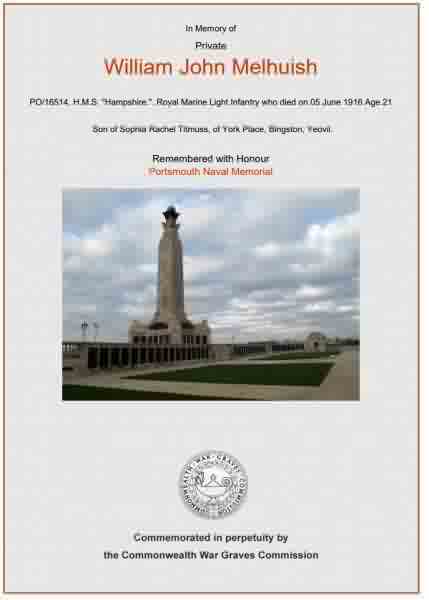 He is remembered on the Portsmouth Naval Memorial and his name is recorded on the Yeovil War Memorial in the Borough. Other Yeovil lads who went down with HMS Hampshire were 17-year old Walter Adams and 19-year old Harry Parsons. York Place seen from Kingston, probably photographed in the late 1960s. 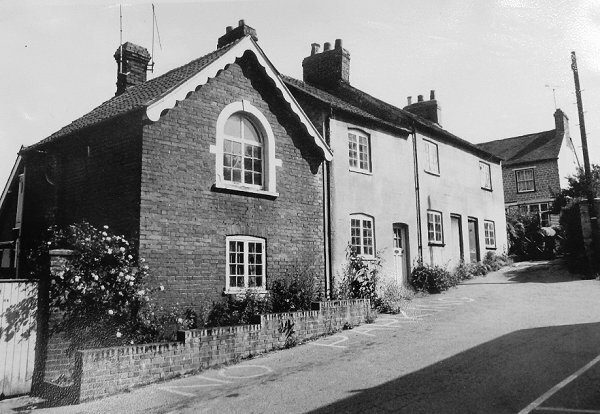 William and his mother Sophia lived in the first cottage at left. The Commonwealth War Graves Commission certificate in memory of William Melhuish.